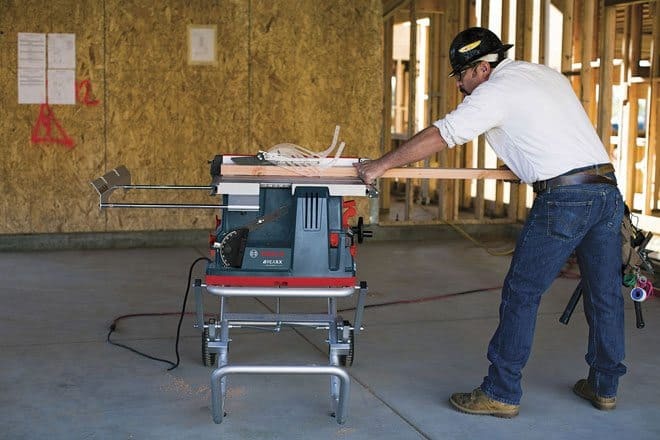 The REAXX Portable Jobsite Table Saw is Bosch’s first table saw with its proprietary flesh-detecting Active Response Technology, which rapidly detects human flesh that comes in contact with the blade and drops the saw blade below the tabletop, reducing the risk of serious user injury without damaging the blade. Safety comes first on any construction jobsite, especially regarding a table saw where a momentary lack of focus could have permanent consequences. Bosch, the construction industry’s technology leader, extends a heritage of award-winning table saw design to enhance workplace safety with the introduction of the REAXX™ Portable Jobsite Table Saw — the first saw with the company’s proprietary flesh-detecting Active Response Technology™. Yellow means the system is set in bypass mode by the operator; this mode is used for cutting conductive materials that can potentially activate the Active Response Technology system. In addition, there’s no override key to lose or misplace, yet still offers various lock-out options to prevent unauthorized bypass mode operation. A near field communicaton (NFC)-enabled phone app offers Bosch REAXX Portable Jobsite Table Saw owners and operators another measure for ease of use. Through the phone app, the saw can communicate information from the onboard control system — such as number of system activations, servicing needs, access to instructions, how-to videos and other details. Also, the saw owner can use the app to manage who can use the bypass and main switches. This capability enables owners and managers to lock the saw as needed, which ensures that jobsite workers cannot bypass the safety system. Bosch REAXX has a 15 Amp, 4.0 Hp max motor that generates 3650 RPM. It’s jobsite ready because it works with onsite generators for a truly portable solution for mobile trade professionals. Varied material cutting requires optimized, maximum horsepower and excellent cutting speed. The Bosch REAXX Portable Jobsite Table Saw offers these attributes along with electronic control soft-start, constant response electronics and overload protection. These advanced motor electronics reduce the intensity of torque buildup and maintain cutting speed under load. Additional precision features include an optimized rail system that boasts a pre-squaring SquareLock™ Rip Fence, which is engineered for precision. Prior to locking, the fence glides along the rail and locks into place for solid and consistent cutting performance. The table is sturdy cast aluminum sized to rip up to 25″ on full-sheet materials (4 ft. x 8 ft.); an on-board rear outfeed support provides an extra 18″ of support for longer workpieces. A rugged sub-base is built to withstand daily abuse related to transport, storage or jobsite conditions. This full-featured jobsite table saw can be easily transported to and from the job thanks to the Bosch Gravity-Rise Stand™, which sets up in seconds. The stand includes 8″ treaded wheels and is sized for easy pickup truck loading or unloading. 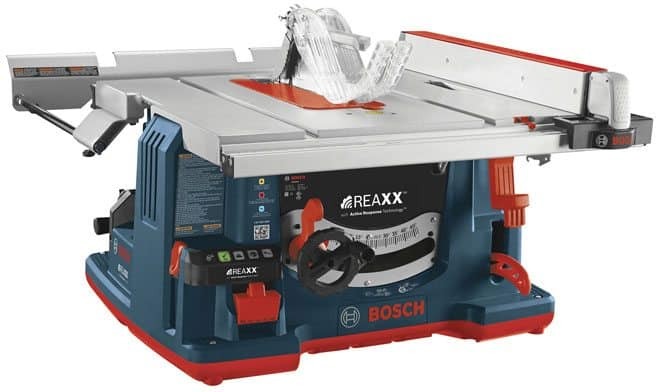 The Bosch REAXX Jobsite Table Saw will be available fall 2015. Weight: Saw 78 lbs., stand 45 lbs.